You gotta hand it to Doug Jolley of the illustrious GameCockAnthem.com. He captures what an early-season SEC loss must feel like. There was nothing funny about 9/11/2001. Georgia Bulldogs fans won't remember the 2010 9/11 fondly either. 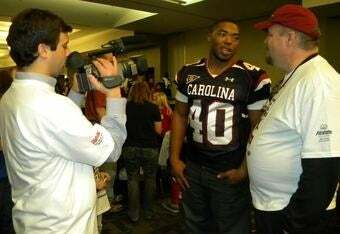 Nobody died this day, but the heart was ripped out of their football team by the Gamecocks, led by Marcus Lattimore's 182 yards and two touchdowns in the 17-6 statement victory. The Gamecock fans however, will happily let this day live in their hearts forever [GamecockAnthem.com]. As of 8 p.m., the site reads "This story is no longer available" and I wasn't smart enough to screengrab it. Shame on me. I apologize. Marcus Lattimore showed the nation why he was one of the nation's most heralded recruits in his SEC debut as he rushed for 182 yards and two touchdowns to lead South Carolina to a 17-6 victory over the Georgia Bulldogs Saturday, vaulting the Gamecocks instantly into discussion as SEC contenders this season.